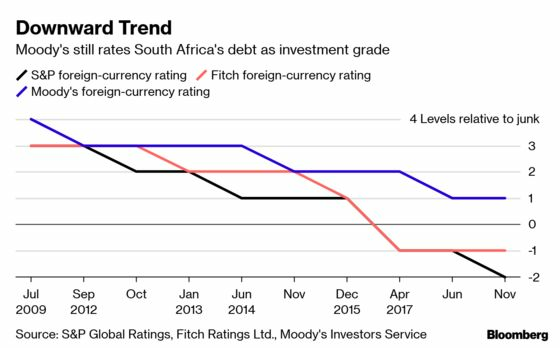 (Bloomberg) -- South Africa may just be able to cling onto the stable outlook of its sole investment-grade rating this week, helping it stay clear of a forced selloff of billions of rand of its debt. Economists are divided on what Moody’s Investors Service will do when it potentially makes an announcement on South Africa’s credit assessment Friday. Half the participants in a Bloomberg survey expect it to maintain a stable outlook on its local- and foreign-currency debt, with the remainder predicting a reduction to negative. Many of those who foresee no change say there may be a move after the May 8 general election. The deepest power cuts in more than a decade by cash-strapped, state-owned company Eskom Holdings SOC Ltd. are hurting efforts by the continent’s most-industrialized economy to recover from last year’s recession. The budget deficit will probably widen to the worst in 10 years as declining tax revenue and bailouts for underperforming government firms weigh on public finances, dimming hopes that the country will hold on to the stable assessment from Moody’s. While Moody’s is scheduled to decide on South Africa’s assessment this week, it may end up only issuing a research report without a ratings action, or nothing at all. A reduction in the outlook tends to precede a cut in the actual rating. A junk assessment would see the country fall out of investment-grade debt gauges including Citigroup Inc.’s World Government Bond Index. That would result in “forced outflows” of about $1.1 billion rand, according to Nomura International Plc. Investec Bank Ltd. estimates outflows of $8 billion to $10 billion. Moody’s will probably give South Africa “the benefit of the doubt” after Finance Minister Tito Mboweni said the country’s strict conditional support for Eskom won’t involve putting the company’s debt onto the sovereign balance sheet, said Inan Demir, Nomura’s head of Europe, Middle East and Africa economics. The state in February committed to providing the utility 69 billion rand ($4.8 billion) over three years as it struggles to emerge from years of mismanagement, allegations of corruption and ballooning debt caused by cost overruns at two large new plants. Eskom, which Goldman Sachs Group Inc. calls the biggest single threat to South Africa’s economy and provides almost all the country’s power, cut supply to homes, businesses and municipalities on a scheduled rotation every day for a week from March 14 to avoid a total collapse of the grid after several generating units broke down. No cuts have taken place this week. Moody’s will likely wait to see the effects of rolling blackouts on economic growth and whether the government’s plan to turn Eskom around is viable before changing its rating, said Sanisha Packirisamy, an economist at Momentum Investments. There is a chance it will reduce its outlook to negative, which it can hold for as long as two years, she said. The ratings company could reduce its forecast for economic growth and raise its expectations for the fiscal deficit, but will likely see Eskom as a short-run shock rather than a crisis with long-run implications, therefore maintaining the stable outlook, said Peter Attard Montalto, the head of capital-markets research at Intellidex Ltd.
“Moody’s has been driven by a strong sense of risk aversion against being responsible for or compounding problems in South Africa when this is really not their job at all – they are there to assess credit risk,” Montalto said.